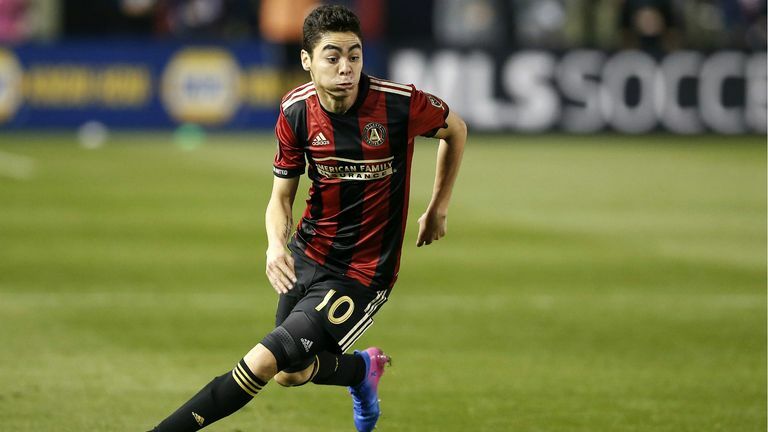 Perhaps it was to be expected that the quality of Major League Soccer would come under scrutiny when Newcastle decided to break their longstanding transfer record to bring in Paraguay international Miguel Almiron from Atlanta United. But there was one particular aspect of the scepticism about his credentials that never did ring true. There was a suggestion that the spotlight of the Premier League, and even the size of the crowds at St James' Park, might take some adjusting to. But that doesn't tally with the experiences of his career to date. It's not just that he won the MLS Cup in front of 73,019 people. Almiron has a history of delivering in front of big crowds on even bigger occasions. "He is highly regarded as one of the top young players in South America," said Atlanta United president Darren Eales when taking him to Georgia in 2017 and it was no idle boast. The most famous goal of Almiron's career came when he fired home the second goal for Lanus in their 4-0 win over San Lorenzo in the final of the 2016 Argentine championship. He went on to be named man of the match in El Monumental in front of a crowd of 52,206. St James' Park, as impressive as it is and as vociferous as the Newcastle fans are, was just the next challenge for Almiron. Despite his youthful appearance, at 25, he is no baby, and that has showed in his performance so far under Rafa Benitez. His impact has been swift. After a bright cameo at Wolves, he impressed on his full debut against Huddersfield and should have had a goal only to see the ball come back off the post. Playing from the left, Almiron has been enterprising and direct, and Newcastle's form has been good. They have won all three of the home games that he has started so far and continue to climb the table. After that game against Huddersfield, Benitez did mention that Almiron will need to get used to the physicality of the Premier League but it hasn't stopped him making a difference. "What we were expecting from him - his energy, his pace, his work rate and the quality in the final third - he is doing that already," said the Newcastle manager recently. The statistics help to quantify his impact. Creativity had been an issue all season, with only the bottom three having scored fewer goals than Benitez's team. There are signs already that Almiron can change that because he is currently creating an average of 2.24 chances from open play per 90 minutes. That's significantly more than any other Newcastle player. In part, that can be explained by the team's upturn in fortunes. They look a more expansive side now than they did at the start of the season when they went winless through their first 10 games. But even in the period since Almiron made his debut, his passes have been more creative than anyone else's - he has a higher expected assists tally than his team-mates. Providing that link between the midfield and the team's target man, Salomon Rondon, has been an issue all season but Almiron is helping to solve that with his ball-carrying ability. His single-mindedness and sheer optimism in possession is getting his team up the pitch. There is much more to Almiron's game than that. In MLS he was the only player last season to rank among the top 10 players for shots, chances created and completed dribbles. But it is this ability to run with the ball that has been the most striking aspect of his work so far. "He is a very, very sharp player," said Newcastle's flying full-back DeAndre Yedlin in an interview that appeared in the club's programme. "He's obviously very quick. On the ball he is a real playmaker who can find the ball in good area. With the ball, he is definitely quicker than me, I will give him that. He is incredibly quick with the ball." Newcastle supporters are relishing that. There is a huge admiration for the job that Benitez is doing and empathy too. The fans appreciate the circumstances in which the coach is working and they understood the need to fashion a functional side that could keep the club up, thus maintaining the hope that Newcastle remain attractive to prospective new owners. But Almiron brings something different, the sense of fun that characterises this club at its best. As such, this is a signing that needs to work and the early signs are encouraging - even down to the fact that he fitted in well at the recent training camp in Murcia, playing table football and ping pong with the significant Spanish-speaking contingent already at the club. If Almiron is happy then he can make these Newcastle supporters happy too and there will be plenty of them making the trip down to Arsenal for Monday Night Football. It will be another big crowd but Almiron is used to them. "If he carries on at this level the fans will enjoy him," said Benitez. They already are. And nobody should be too surprised about that.